Ford will launch its upcoming sedan the Ford Fiesta 2011 in July 2011, its designed using the Kinetic design language of Ford. 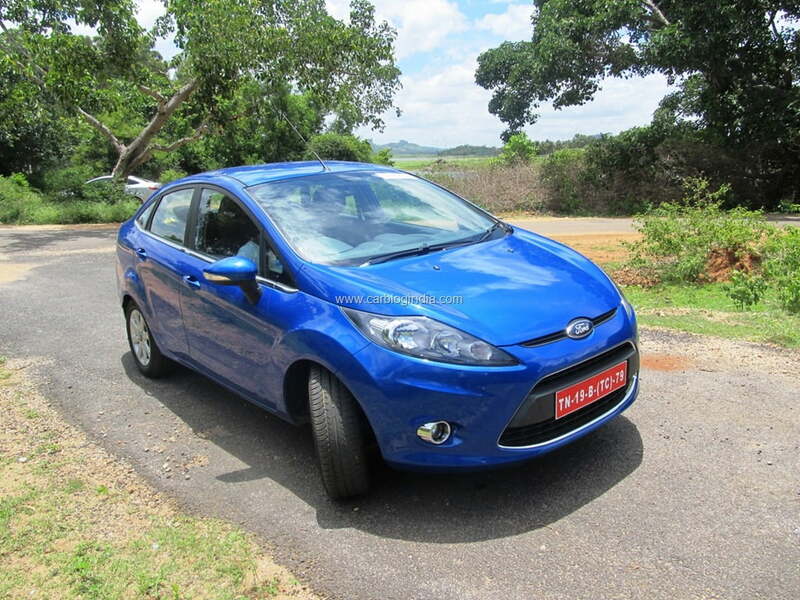 We recently drove the all new Ford Fiesta 2011 at Bangalore at the Ford Fiesta Deep Drive event organized by Ford India. We also got an opportunity to interact with the Ford Fiesta Designers and Technology experts from Ford who have put in a lot of effort to make this car a very suitable and adapted car as per Indian road and driving conditions. 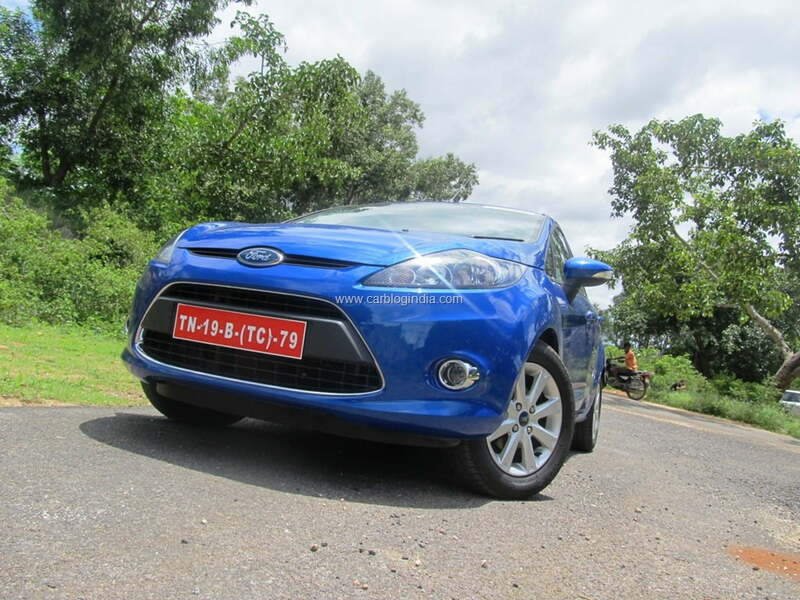 In the deep drive event we drove the all new Fiesta on a 170 KM drive between Bangalore and Mysore, India. We drove both Diesel 1.5 Litre Manual as well as the Petrol 1.5 Litre Manual turn by turn on our way through the drive. 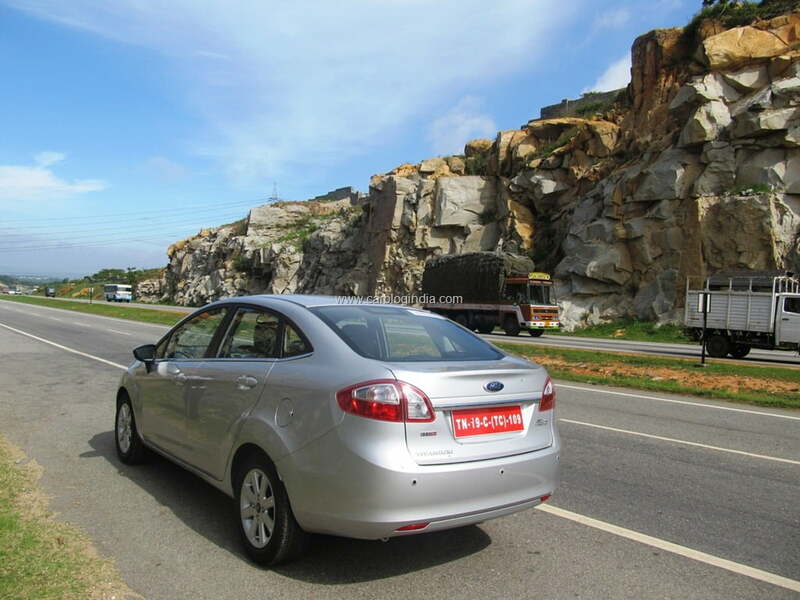 We started off from Bangalore city towards the Bangalore-Mysore Highway on the morning of 9th June 2011. We started our drive with 1.5 Litre Diesel Duratorq TDCi / CRDI Engine powered Fiesta. The diesel car delivers a 90 BHP of power at 3750 RPM and 204 Nm of torque between 2000 and 2750 RPM. The engine is mated to a 5 speed manual transmission with very well optimized gear ratios. When we started our drive in the congested traffic, I found bit difficult to manage the clutch, but within minutes I figured out that I need to use the accelerator bit harder to get a good pickup. What was amazing is the second gear which pulls the car very well and the acceleration in the second gear is very good with the turbocharger giving it a further boost. In second gear, pressing hard on the accelerator can make you reach up to 80 KMPH, which is an awesome wide speed range for the second gear. For most of the congested stretch of about 18 Km within the Bangalore city, we didn’t get a chance to go past second gear. One thing I really like about the diesel is the wonderful torque it delivers and minimal gear shifts needed while dealing with the stop-and-go city traffic. It does take some time to get used to of the turbo-lag at lower RPM, but once in motion, the car is butter-smooth. One very impressive feature is the noise reduction. Ford engineers have worked really hard to design it in the one of the lowest NVH (noise vibration and harshness) cars in its segment. The car feels very quiet with the windows rolled up, the cabin is quite comfortable in the dense traffic full of noise as the noise doesn’t bother on the inside of the car. Every small element is designed to keep the vibration and noise to a minimum. For the first 5 to 7 KM, the engine did make a characteristic diesel noise, which was slightly audible from inside, but after it warmed up, the engine noise was almost negligible. Once we reached the highway, it was a short assembling of the convoy (of 6 Fiestas – 3 Petrol, 3 Diesel and 3 guiding cars with us), we started the test of performance on highway. 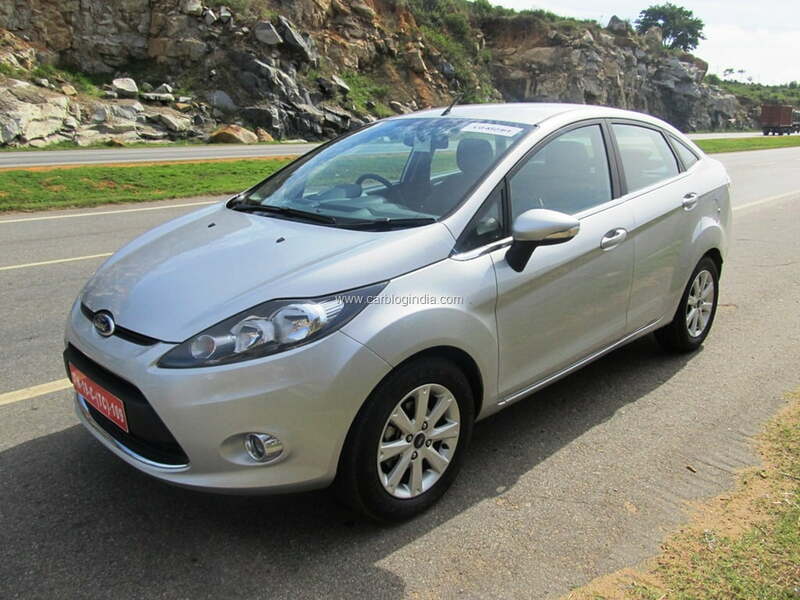 On the highway, Fiesta Diesel is a treat for auto enthusiast, it delivers wonderful acceleration with the turbo-charger working its best to make it run smooth. The noise is almost totally eliminated once the windows are rolled up and the car very easily reached till 140 KMPH. After 140 KMPH, it takes slight time to go further, but its very impressive. The torque really helps pull the car very well and overtaking is very easy without bother much about the gear shift. The steering is rock steady even at very high speed or on cornering and bumps, the credit goes to the Electric Power Steering with Pull-Drift Compensation system by Ford. The steering has been kept about perfect in effort and does not shake with the bumps or at the corner as there is an electronic logic to control how much effort is needed from driver to turn the steering. I helps you stay confident behind the wheel and we didn’t feel any need to slow down even at 140 KMPH. After the speed, we tested the cruise control which is not available in the others cars of this segment. I have driven larger cars with cruise control and I personally like it very much. The cruise control does not help in city traffic, but on long drives on a highway, it’s a very comforting feature. The cruise control is provided with easy access control on the right on the steering wheel itself. Once you set the cruise control on and set a speed, the car keeps going at that speed and you can keep your foot off the accelerator pedal. There are buttons on the steering to increase or decrease the cruising speeds and you can also cancel it and resume it at the click of a button. Also as soon as you hit the brakes, the cruise control automatically turns off without pressing any button even. We crossed through many slopes, downwards and upwards and diesel Fiesta just glided on the road. The suspension is designed to be a little hard but it gives great handling and confidence at higher speeds. It has got a 4 channel ABS with EBD which helps to keep the car in control even on hard braking. What was surprising to us was that even the top end variant has drum brakes at the rear and not the disk brakes. Overall ride quality is very good, the bucket seats hold the back and side very well and the back does not ache even after 4 hours of continuous driving. The seat s height adjustable with manual control, so the seating position can be very well adjusted for different height of drivers and the visibility is also good. The outside mirrors are electrically foldable as well as adjustable from inside. The outside mirrors automatically fold when you unlock the car and close when you lock it. The mirrors also have a very nice safety feature of blind-spot detection. The sides of the mirrors have a slightly different curvature to show you even the rear view of the blind spot which is otherwise not visible in most of the convex outside mirrors of most cars. The boot space is fairly large and can further be increased by dropping the rear seat flat. My co-driver Abhishek even demonstrated by getting completely inside the boot to show how large it its. 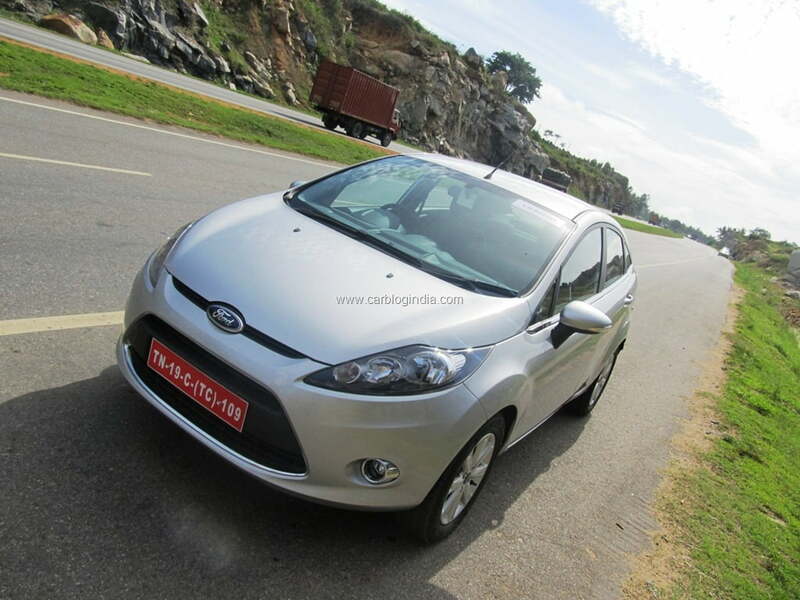 On our way back to the Bangalore from the Bangalore Mysore Highway, we drove the Ford Fiesta 1.5 Ti-VCT Petrol MPFI engine car. 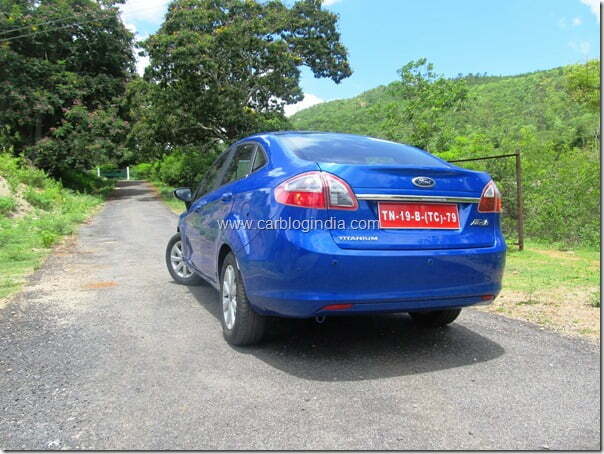 The petrol engine churns out 108.5 BHP of power with 140 Nm of torque. 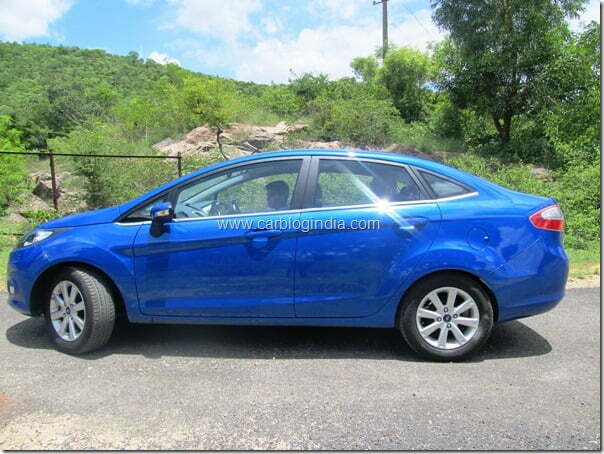 It is also equipped with a 5 speed manual transmission gearbox. The The cabin quality, interior space, suspension and steering quality are same. Petrol also has the same cruise control system. What was strikingly different is the performance of petrol Fiesta compared to the Diesel Fiesta. The Petrol car gives a good punch in the first and second gear, but as you speed up to 80 KMPH, you feel that it is missing on the punch which diesel offers with the high torque. Driving petrol was also fun and it was more sporty till 80 KMPH after which we realized the engine was making hard effort to continue to deliver that punch. 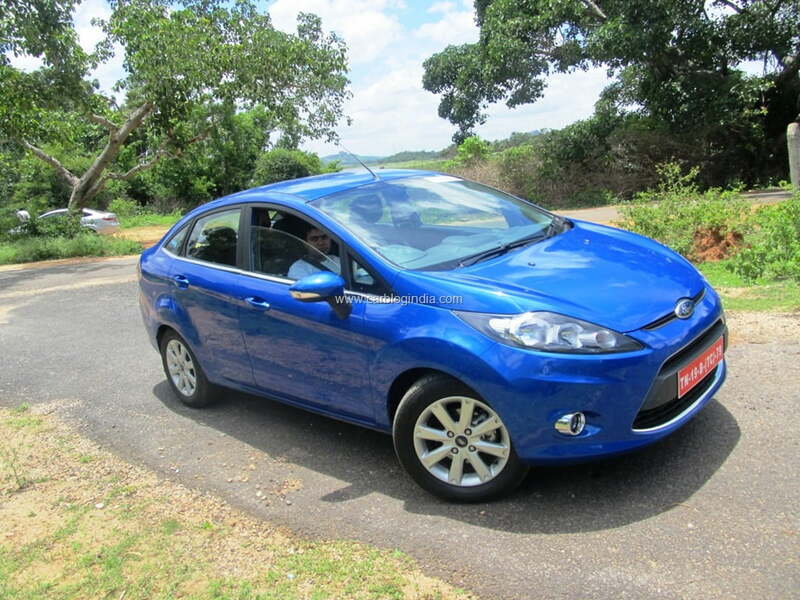 The high speed performance of the Petrol Fiesta is not as pleasurable as with the diesel. Also in congested spaces, if the speed falls and you are in higher gear, the petrol fiesta needs a down shift to pull is well, else it accelerates very slow contrary to diesel which with high torque requires lesser shifts in overtaking as well as pulling to higher speeds. 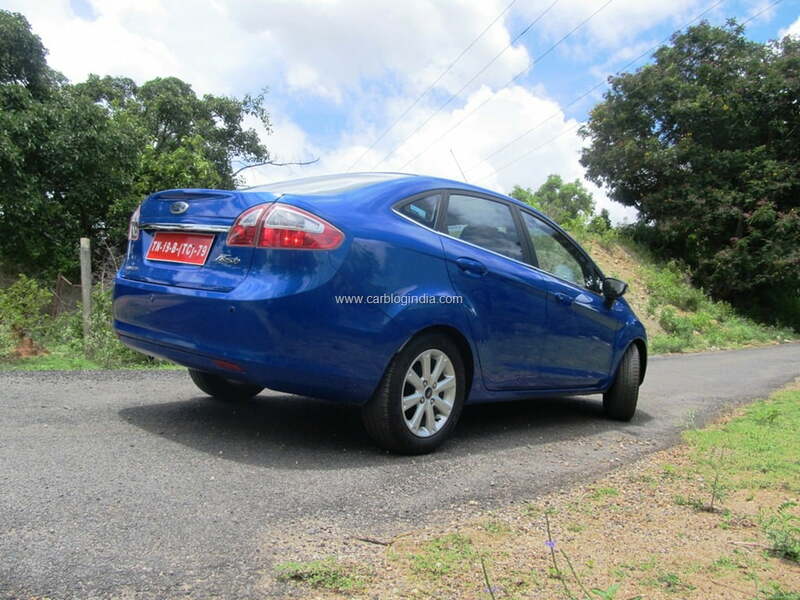 What I like about the Petrol Fiesta is that it is responsive and quick from the starting, what I did not like much was the lack of punch after the car reaches about 80 or 90 KMPH. If we consider everyday driving, we don’t drive that fast in the city, so its not much of a disadvantage, but on highways, Diesel Fiesta beats the petrol. Also the petrol Fiesta required more gearshifts for overtaking competed to the diesel. Overall handling and comfort of the Petrol were good, I also felt slightly softer clutch on Petrol which is good for a congested city driving, also the petrol engine is lot quieter compared to the diesel, the petrol is more agile in lower gears and power delivery is also quite linear. In terms of exteriors, the Fiesta did attract a lot of eye-balls in admiration on the drive and I also personally like the design of the Fiesta. In terms of ride height and the overall stance, the 2011 Fiesta looks elegant, large as well as sharp at the same time. The rear is slightly tapered towards inside from the sides which gives it sleek and smart look. Large alloy wheels give it muscular look and style. The slant sideline from front wheel till the tail lamp gives it’s a dynamic and large look. The side profile is also pleasing to eyes and looks aerodynamic and smooth. The inverted trapezoidal grille gives it a fresh new look with chrome garnished fog lamps and follow-me headlamps give it further elegance on the front of the car. Voice Control feature allows for hands-free control over six functions: mobile phone, radio, CD player, USB drive, iPod and temperature. Integrated Aux-in Port to ‘plug and play’, digital signal processing to enhance sound quality, as well as intelligent phone utilities to swap, hold, mute and transfer calls, are features that further define Fiesta’s intuitive technology. 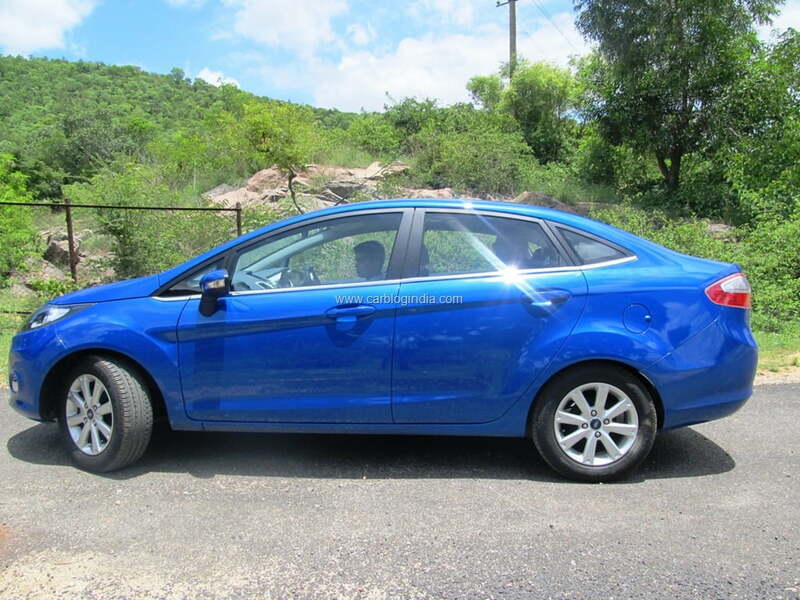 Ford Fiesta 2011 fares well at most of the practical points, the major competitor to the Fiesta 2011 will be the Hyundai Verna Fluidic, Volkswagen Vento and Honda City. 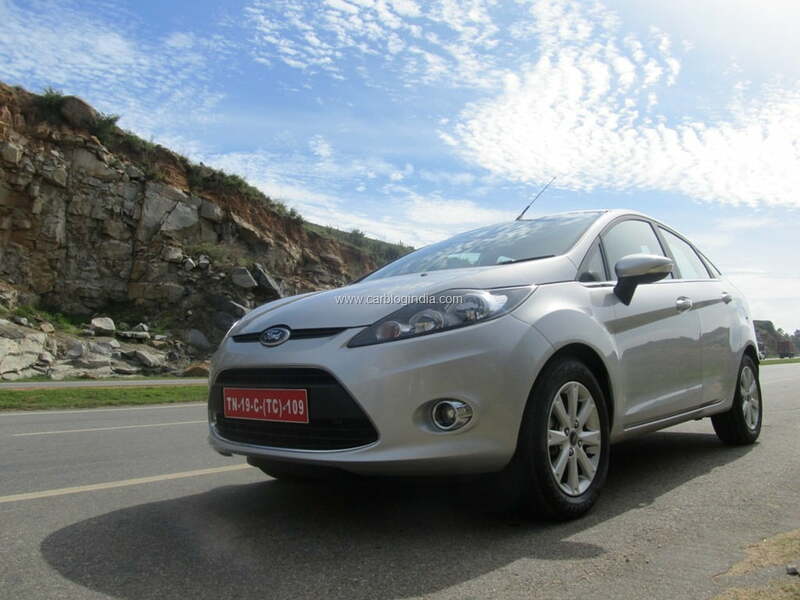 Pricing will be a major deciding factor on whether the Fiesta 2011 will give a tough time to its competitors or not. We will be following the launch events and will bring you latest updates on the same. You can stay tuned by liking our official Facebook Page or by signing up for our free email newsletter.